This germination troubleshooting guide highlights some of the most common problems and mistakes made with germination. Know that problems with germination can often appear not because of the quality of your seeds, but because of mistakes somewhere in the setup or with the steps in the germination process. If you know the cause why the germination of your seeds has failed, this guide can help you prevent this from happening again. Don’t think that poor germination is always your “fault”. There can be many factors that can make germination difficult or impossible. Maybe the soil you just bought is infected with fungus or your garden store simply recommended the wrong soil. These can be situations where poor germination is pretty much inevitable. Sometimes even things like a broken or incorrectly calibrated EC meter than lead to poor germination results. In some very rare circumstances, you may do everything right, but your seed happens to contain twins, that is two embryos in one single seed. It may also happen that your seedlings turn out to be triploids that grow three sets of leaves instead of two. These occurrences however are so rarely happening that we won’t go over them here in this troubleshooting guide. 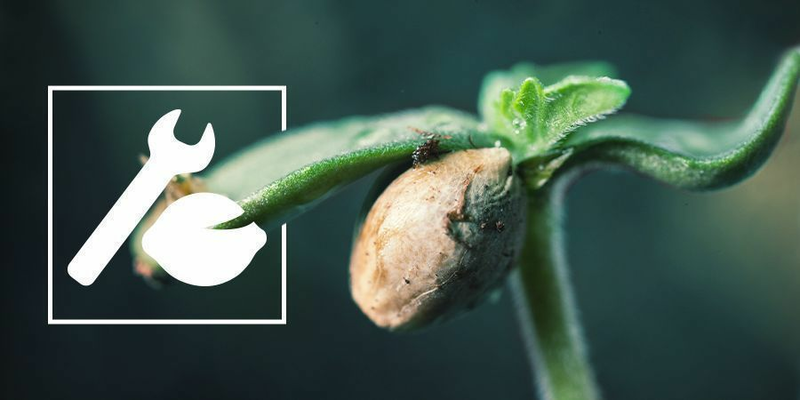 SHOULD YOU PRE-GERMINATE YOUR CANNABIS SEEDS? Many cannabis growers are still pre-germinating seeds in a glass of water or with the “paper towel method”. In the first case they would pre-soak the seeds in water for some days and in the second they put seeds between wet paper towel sheets and have them germinate there. Finally, you've received your precious seeds. But how to germinate those lovely little seeds into a beautiful green plant? The drawback with these pre-germination methods is that they are very error-prone. The potential problems from these methods like fungus growth or damage to the sensitive tap roots when moving the seed to a new medium are normally outweighing their supposed benefits. Good quality seeds don’t normally require pre-soaking, whether it’s in water or with wet paper towels so that it is recommended that you don’t use these methods. Have your seeds germinate in their final pot, which helps keep your risk down for a higher chance of germination success. If your seeds won’t germinate, the first thing that you should do to find the cause is to look at the seeds. Seeds that won’t germinate can have changed their colour, most of the time they may have gotten noticeably darker. There can also be a white coating at the rounded end of the seed. When you crack open the seed you can sometimes notice that the embryo has become soft. The other possibility is that seeds started out alright at first, the seeds cracked open and the tap root appeared but growth stopped. A common cause for failed germination is when the substrate became too dry at some point. You can check whether this was the case when you crack open the seeds. An indication that the seed needed more water is if the embryo looks healthy, white and firm. If you tried to germinate outside, you should also consider whether frost may possibly have stopped germination. 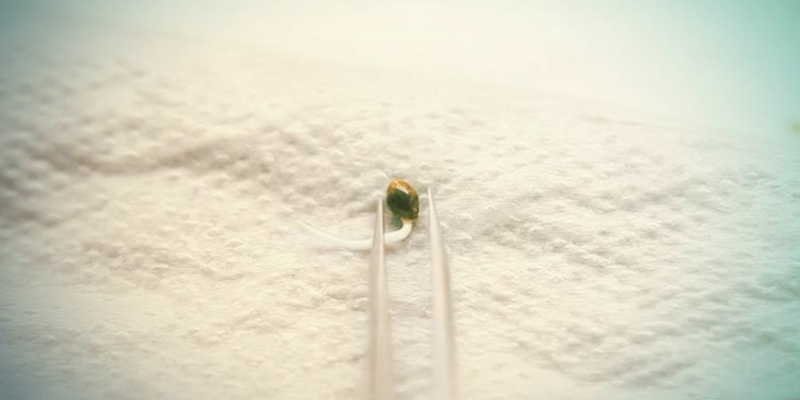 If you spot a white, fluffy looking substance on one end of a seed that turned dark it is very likely fungus, one of the most common reasons for failed germination. Fungus can appear under wet and cold conditions and in an environment where oxygen is lacking. There can be many reasons for a fungal infection like poor soil quality, incorrect pH, overwatering, high humidity, poor air circulation or cold temperatures. When you open a seed that has been infected by fungus, the seed will have rotted and has turned into a soft, yellowish liquid. GROW TIP: Promote air circulation when using mini greenhouses. If you look around in seed and garden stores you will see that many of them carry mini greenhouses as a means of achieving a successful germination. As a matter of fact, at Zamnesia, we also recommend using them for the best chances of a high germination rate. A product like the Propagator Pro fits into this category. However, a completely closed mini greenhouse only makes sense if you want to root clones and cuttings. Seeds and young seedlings need good air circulation and a well-aerated growing medium. The only thing that needs to be kept moist is the soil or growing medium. Ambient air humidity is best kept at 50%-80%. If you want to cover up the seed tray for whatever reason, then make sure that the lid is at least half-open for adequate air circulation and humidity levels. In those cases where the seed started out normal and developed a tap root, but then stopped growing, fungus can also be a reason for this. But it is also possible that the seed was killed by high temperatures, such as when you used a heat mat and you set it at a too high temperature. One other reason why an emerging seedling could have been killed prematurely could be if the EC is too high. If you suspect the EC, you should check your substrate’s EC. While you are at it, it is always a good idea to check your EC meter and calibrate it if neccessary. Tap water with its often high levels of chlorine, fluoride and salts can be another reason for a failed germination. The minerals and salts can stunt the growth of the very sensitive seedling. If you really need to use tap water, fill a bucket with hot water and have it sit outside for a day so the chlorine can evaporate. Even better, use bottled water for germination. Either way, the correct pH for your water is very important. If you germinate in soil, you may have to adjust the water pH to 6.5 and if you germinate in rockwool even lower, to about 5.6-5.8 pH. GROW TIP: When you water your substrate for germination, use pure pH adjusted water only. Don’t give any nutrients or teas. Seeds or young seedlings won’t require them and giving pure water is the best for promoting healthy root growth. GROW TIP: Avoid jiffys and peat pellets. In contrast to what advertisements may say, Jiffys and peat pellets are not optimal for seed germination. Many times, those have an alkaline pH that would hinder germination rather than help it. If you have poor results with a particular product, don’t use it next time and switch to another germination method. When your seedlings grow leggy and appear weak, the most common reason for this is a lack of light. Low light levels mean that the seedling will stretch. Give them more light. You can just adjust your grow light so it is closer to the seedling. If you can’t do this for whatever reason, place the pot with the seedling higher on a stand or a second pot to move it closer toward your light source. 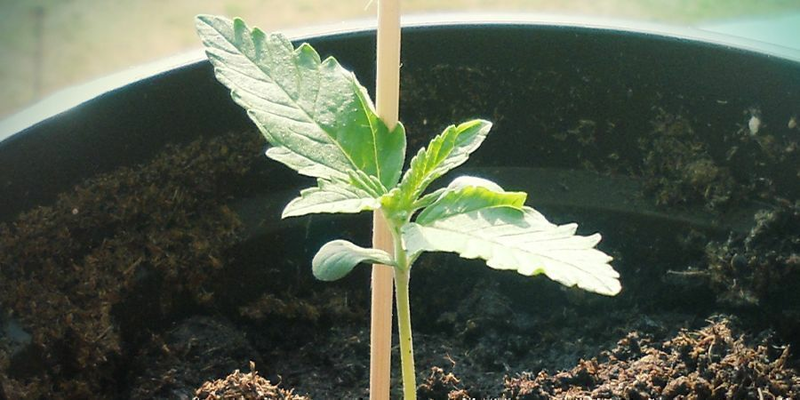 GROW TIP: When your seedling has already grown long and leggy because of not enough light you want to support it with a stick so it can regain its strength once you moved it closer to the light. This is another problem caused by a fungal infection. In this case, the reason for the fungus can be infected soil, high humidity or a waterlogged substrate. The fungus infiltrated and damaged the stem of the seedling, causing it to wither and ultimately to collapse. GROW TIP: The correct way of watering is important to avoid “damping off” of seedlings. On one hand, a seedling cannot retain much water since they only have very small roots and few leaves, which means they can quickly dry out. On the other hand, too much water can cause waterlogging and fungus growth. Make sure the substrate or growing medium is always moist so that the seedling can grow, but don’t overdo it with watering. 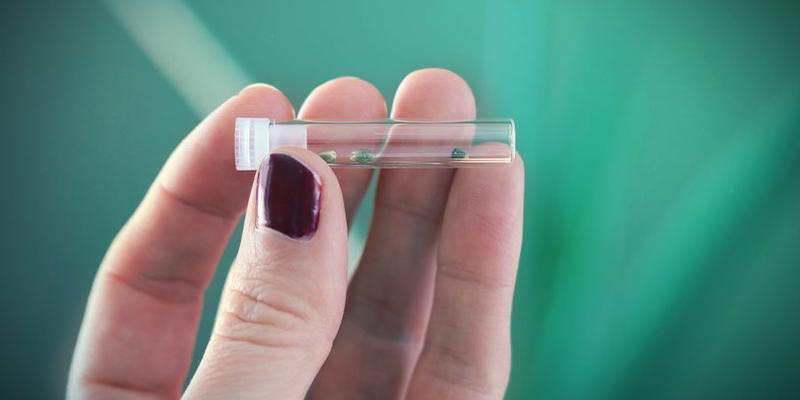 Seedlings are tiny cannabis plants that just entered the world, hoping to develop high-quality buds one day. Check out how to handle these tiny specimens.